Owning a sailing vessel or yacht in NYC is very cost prohibitive. Fortunately, Classic Harbor Line (CHL) is here to offer classy and unique boating experiences to help New Yorkers escape the city without actually leaving it this summer. 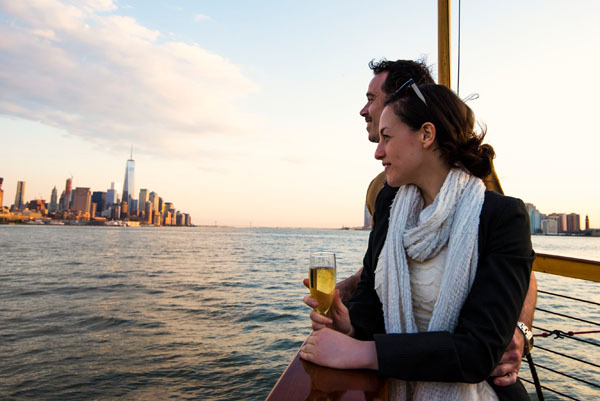 A blissful afternoon sailing on a Gatsby-style schooner gliding by Manhattan skyline out to the Statue Of Liberty is within your reach at CHL. 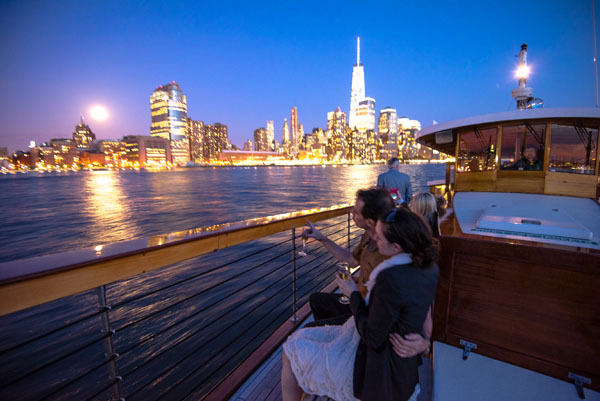 Located at Chelsea Piers, CHL offers a variety of sailing experiences from the lavish Chef Morimoto Sunset Sushi Sail dinner cruise to a romantic full Moon Sail on a warm summer night. Other sailing options include 2-hour afternoon sails (don’t forget the sunglasses and sunscreen!) 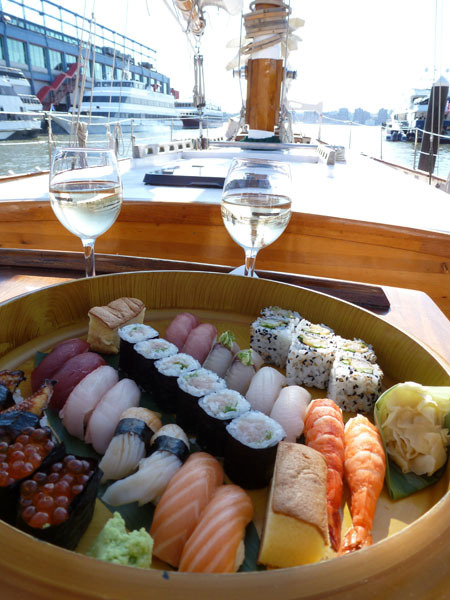 Sunset Sails, and weekend brunch cruises. Spending time outside and being at one with nature is a goal for many locals, and the feel of the wind on a sailing yacht is the perfect way to spend a couple of hours. Classically designed yet sleek and modern, you’ll find sailing aboard Schooner America 2.0 and Schooner Adirondack relaxing and soul-refreshing. Today’s harbor may seem like a bustling and busy waterway, but the art of sailing is no stranger to New York Harbor. Just a century ago, many of the immigrants who came to America made the journey on sailing vessels that glided past the Statue of Liberty on the way to Ellis Island. In 1851, it was here in New York City (in the lower east side to be precise) where the first winner of the America’s Cup was built – Schooner America. Designed and built by Scarano Boat Builders, Schooner America 2.0 is a tribute to Schooner America and is the world’s only fully Eco-friendly sailing schooner. At 105 feet, sailing aboard America 2.0 is a one-of-kind experience. She is currently one of the largest sailing schooners offering day trips and romantic sunset sails around New York Harbor. Classic Harbor Line Harbor Line is a national company with a collection of turn-of-the-century style schooners and motor yachts operating in New York City, Boston, Newport, RI & Key west. Classic Harbor Line offers the alternative to typical sightseeing boat tours with most tours on eco wind-powered sailing schooners that are never over-crowded. 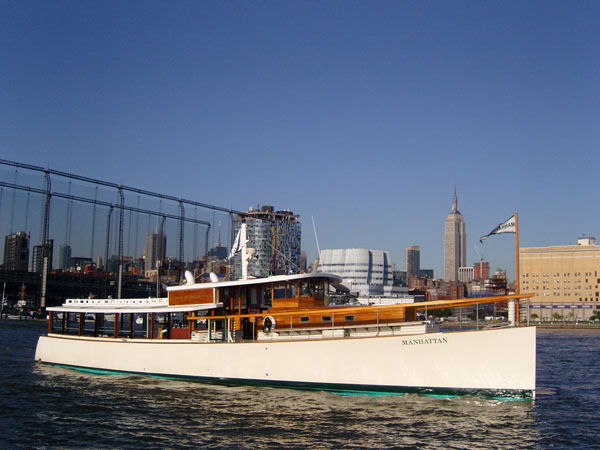 In its home port of New York City at Chelsea Piers, Classic Harbor Line offers unique programming as well, with special cruises like the critically acclaimed AIANY Around Manhattan Architecture Tour, Morimoto Sushi & Sake Sail, and Full Day trips to Bear Mountain. Classic Harbor Line’s parent company and builder of all the yachts is Scarano Boat Building in Albany, New York, where all boats are made proudly using only American-made materials.